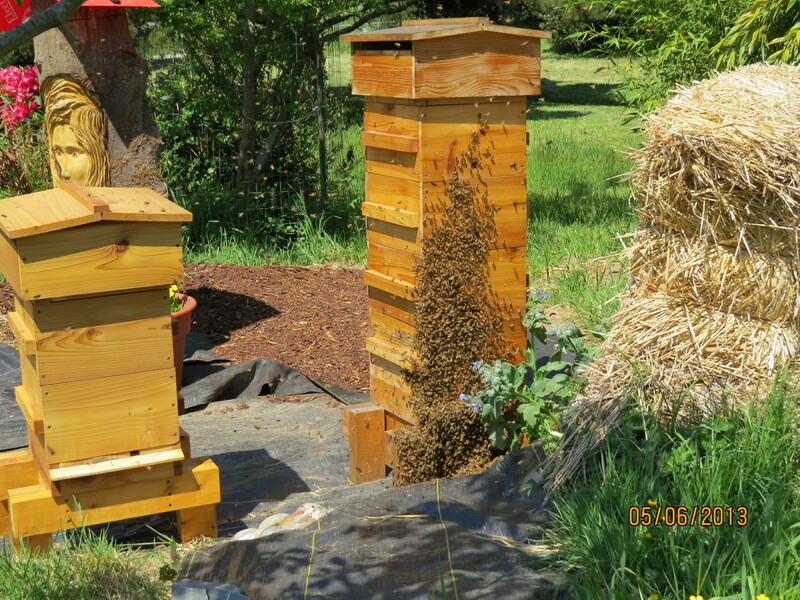 Vernon’s Perone hive, showing the brood box (24 inches in length, width and depth), one super and the roof. Construction was of Douglas Fir with the exterior thin-coated with linseed oil. 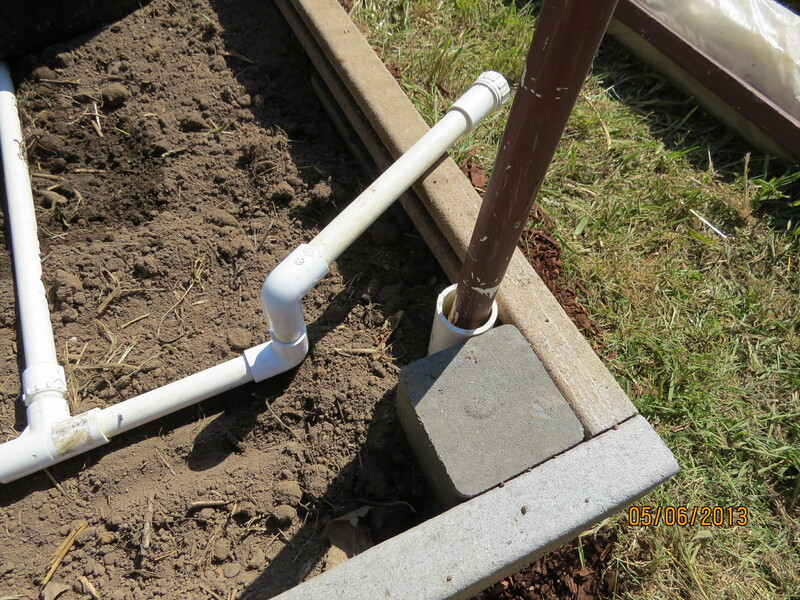 Materials cost about $140 including the concrete footed mounting frame and a sheet of galvanized metal for the roof. 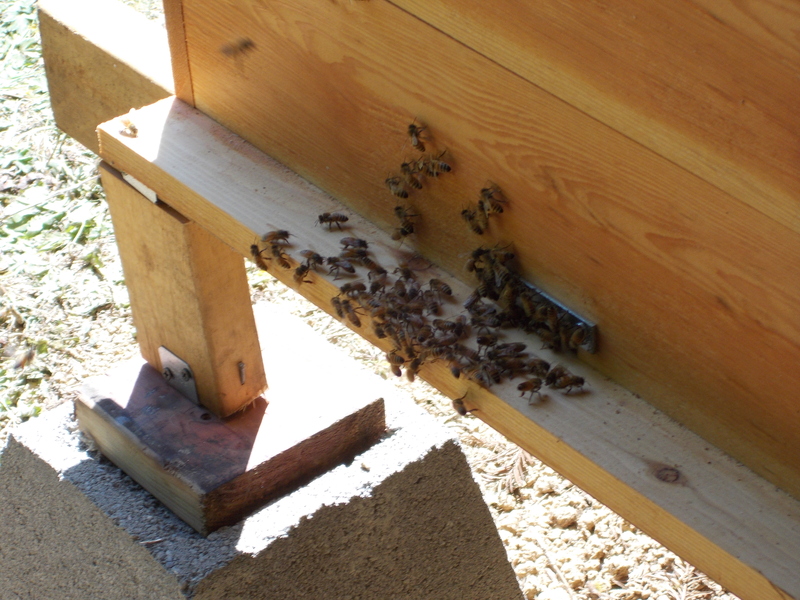 When my first Warre hive was threatening to swarm, I knew I was in trouble. I didn’t want any more hives but I wanted to give it to someone who would really appreciate a prime swarm. 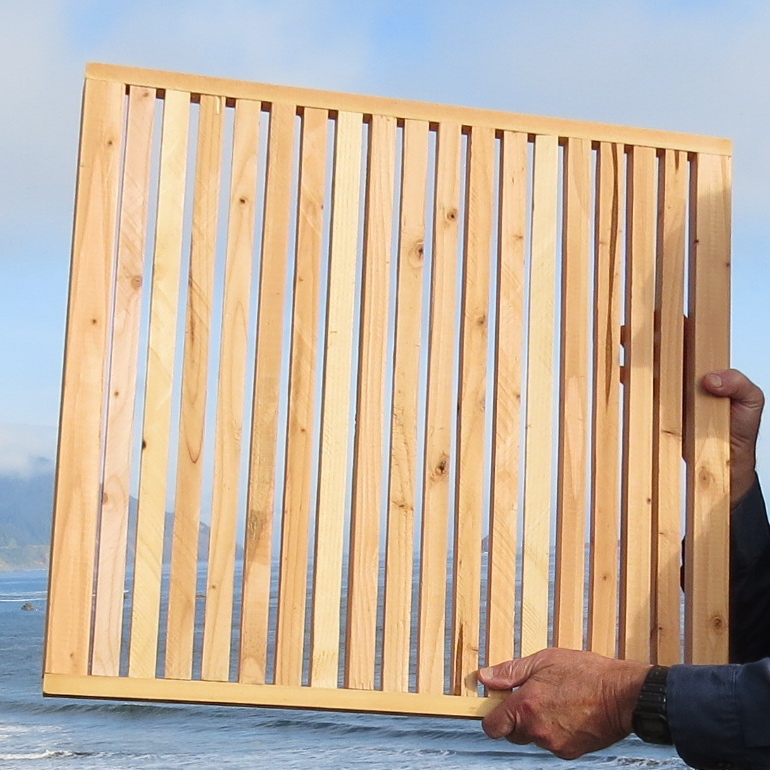 I found out about Vernon through the new bee keeping network of Oregon South Coast Beekeepers Association…he had just built a Perone hive. He wanted a swarm rather than package bees. That was me a year ago. 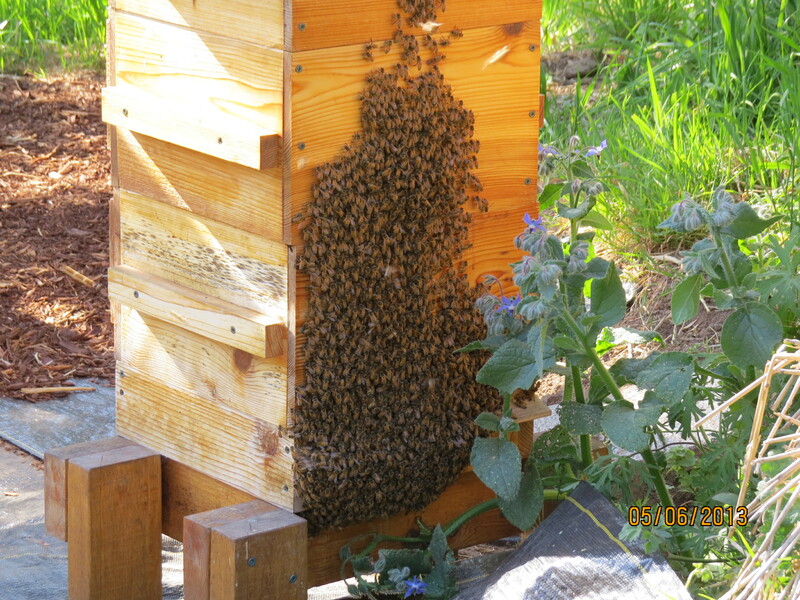 The bees swarmed on Mother’s Day, May 12, 2013. 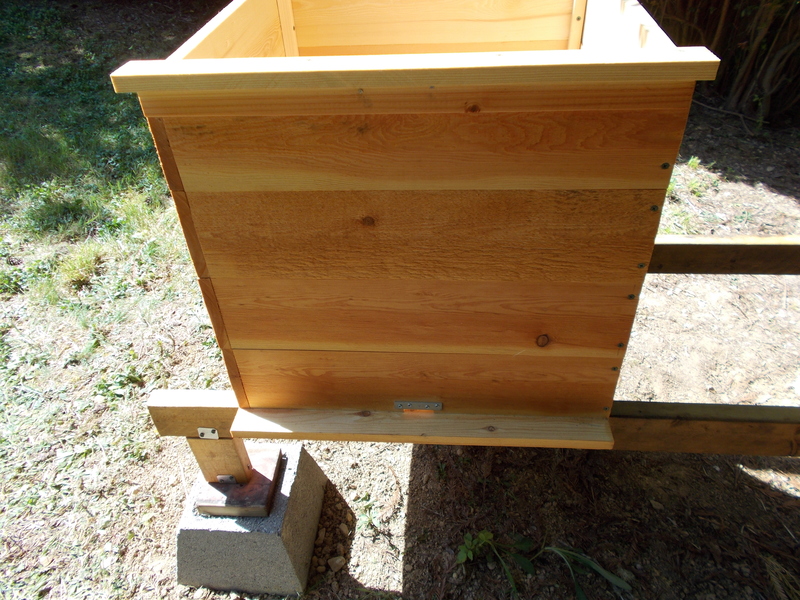 We handed him a bucket of bees a day later, but I didn’t want to leave it at that, I had never seen a Perone hive before and wanted to see how big it was…I wanted to make sure our bees had a good home. The authors are from Chile so the useful dimensions are in metric. 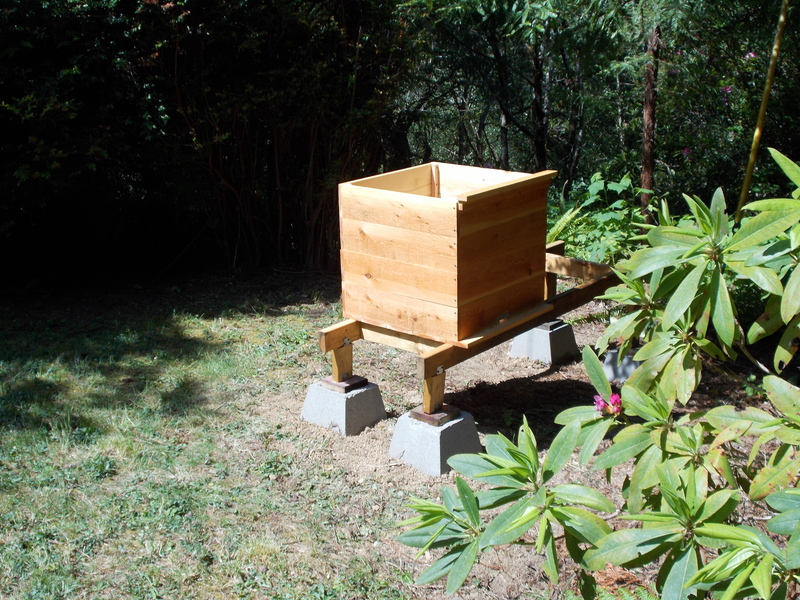 Perone insists that the internal dimensions of the brood box be 57 X 57 X 57cm, which is 184.5 liters. Each of his supers is 32.5 liters. Whenever I converted to English units I adjusted the measurements slightly for convenience. 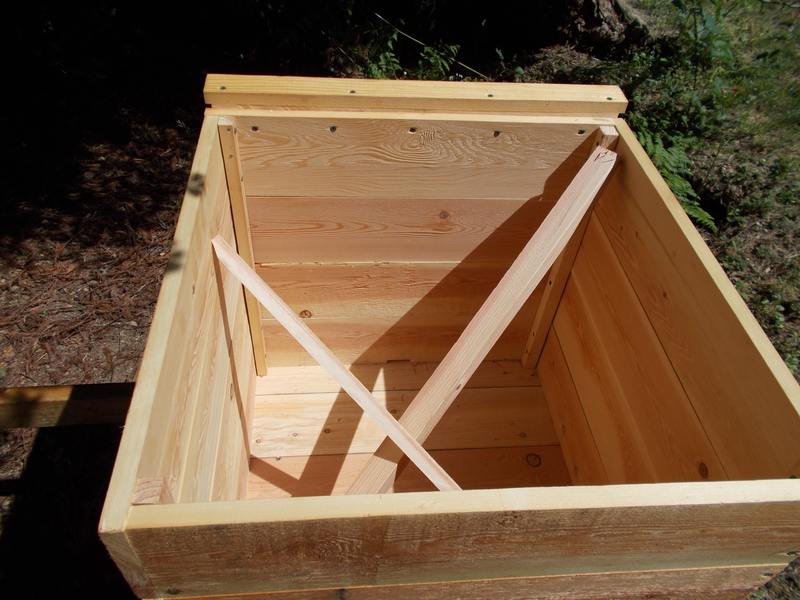 My brood box is built of 1 X 6 inch lumber, which of course actually measures 3/4 X 5 1/2 inches. Scrap lumber sticks placed inside the brood chamber to help support the expected massive comb loads. The height of my supers is 4 1/2 inches rather than the 4 inches recommended by Perone. I measured my bars in metric (24 cm height and width, which is about 15/16 inches) and cut them on a circular saw from 2 inch cross-section stock. There were 49 bars: 17 bars for the brood comb spaced 9mm apart, and 16 bars each for the two supers, spaced 10 mm apart. Perone insists that the brood comb bars be 9mm apart because he feels this helps the bees maintain optimal brood comb temperature to fight infestations. Also, that spacing is preferred by the queen, so an excluder isn’t needed to keep her in the brood box. Note the lower entry and 2 inch deep landing strip. The metal strip above the entry is a mouse guard. 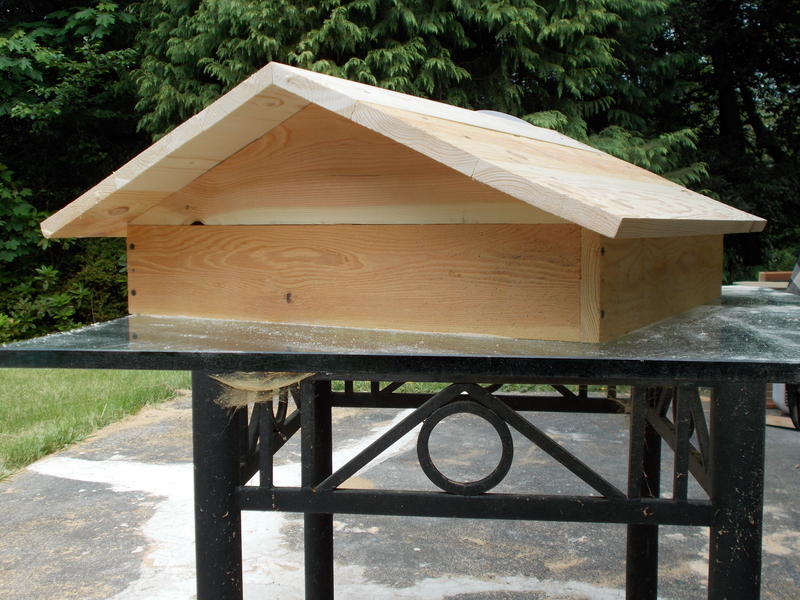 The upper landing strip is also attached to the brood box. My gabled roof has a 5 1/2 inch peak and the ridge is 31 1/2 inches long. The roofing is made from 1 x 6 inch boards and is covered by galvanized sheet metal. 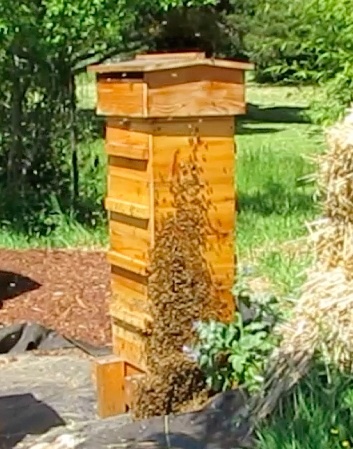 Side view of the hive just after the swarm dump. Everyone’s confused! It wasn’t long before scouts returned and started their waggle-dance. This video was shot on May 23rd about 9 days after installation. Today I removed the super from my Perone hive and had a chance to look down through the brood box grid bars. 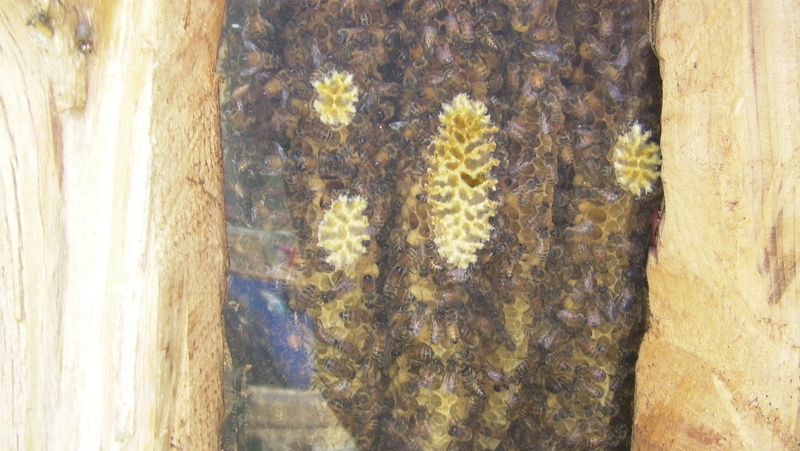 The attached photo shows that the bees have been building weird comb: rather small, all in the southeast corner, cross-combed to the extreme, and the comb cells between the bars are oriented “up.” After almost three months the population of the hive seems about the same as the original swarm. Obviously, my inclusion of a super from the beginning was a dumb idea. The colony isn’t going to come close to filling their brood box by winter, much less a super. My only defense is that I believed the South American beekeepers’ claims of rapid proliferation in the first few months. 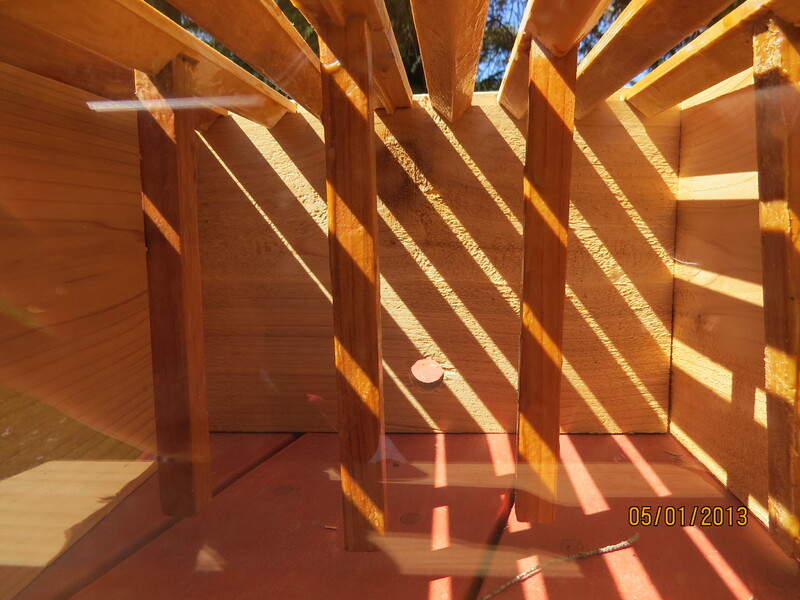 Now the roof lid is directly over the brood box bars, almost touching them, so maybe the bees won’t be able to move over the top of the bars so easily to produce vertically-oriented brood cells. That might reduced cross-combing, too. Still, it’s already August and I don’t think there is time before winter for the bees to change their ways and build enough aligned combs towards the center of the grid. They will have a hard time increasing their numbers significantly in their present nest, which may also be hard for them to heat in winter. I can’t think of anything else to do now that I’ve removed the super. Unless you have any suggestions I’ll follow the Perone philosophy and let the bees figure it out. The population of the Perone hive colony seems to have increased significantly in the last few days, based on the unprecedented numbers entering and leaving the hive entryway. Maybe they’ve increased their numbers for a last big food gathering push before winter. It’s still a mystery what they are foraging on; they still fly straight up and over some big trees and disappear when they leave the hive, and they return from the same direction. Lots of bumblebees have foraged around my house, but zero honeybees. Last time I gave you an update I was concerned that there was so much cross-combing, and the comb was smaller than I’d expected. It appears that the oddball comb has produced lots of brood though, the comb is ugly but functional, so I’m going to follow the Perone approach and leave the bees to gather their own supplies. If this colony doesn’t make it through the winter I’m going to feel like a murderer. I’ve started building another Perone hive using lessons learned from this first one. The main difference is a 11in X 16.5in observation window. I’m going to mount the new hive on the same platform with the first one, but probably the entry will face in the opposite direction so the bees won’t get confused about which entry to use. 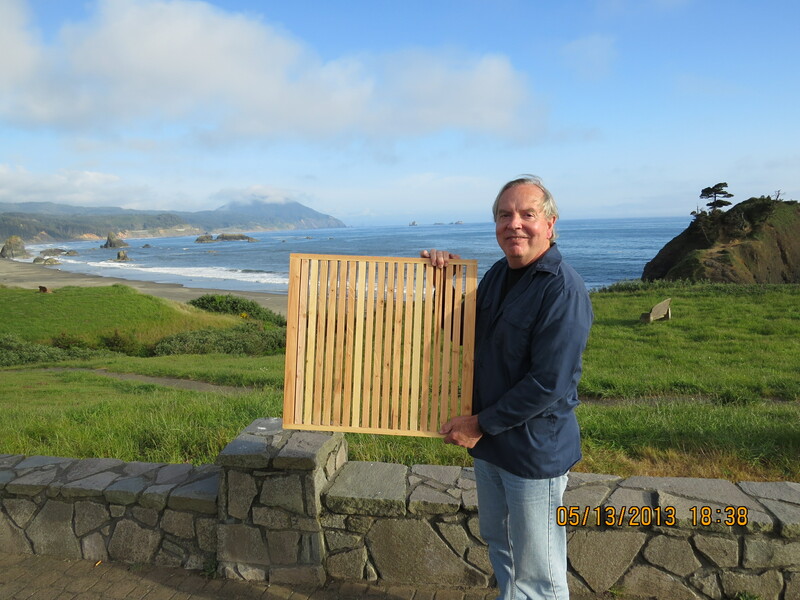 November 26, 2013…I took my new & improved Perone hive to the beekeeper’s meeting in Gold Beach last Thursday and got a lot of interest. In fact, Del is thinking of using something similar while he’s in the Peace Corps. The new version has two large picture windows so I won’t be completely in the dark about activities inside the hive the way I am now. The day-before-yesterday I checked the first hive when the weather was damp and in the low-to-mid 50’s and there were no signs of life. I put my ear to the side wall but could hear nothing, so I lightly rapped it with my knuckles and three bees came out to see what was going on. I concluded that the hive was simply hunkered down inside due to foul weather. 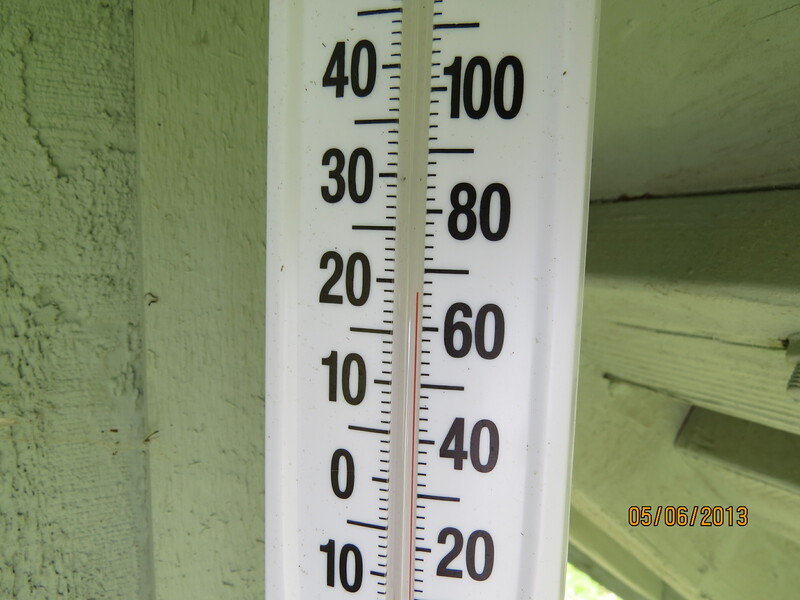 Really, I’m not sure what the temperature was outside, though I have two thermometers that weren’t cheap. It’s nearly impossible to find a mercury thermometer anymore: The alcohol substitutes are safe but inaccurate. When I compare thermometers at a store they always show different readings (i.e., two different thermometers of the same make & model may have readings over 5 degrees apart). The Italian bees we are keeping are apparently notorious for taking the day off when it’s coolish outside. My friend Steve Sottong of Eureka recovered a swarm he claims was about 3X the volume of mine. His bees are little and black, probably the species native to Great Britain, and they forage when it’s in the high 40’s. Del suggested again that I feed my bees. His idea had some appeal: Hang a Christmas candy cane from a top bar using a string or thin flexible wire. Of course, once I do that I no longer have a “pure” Perone experiment going, so I’m torn. Maybe the foragers are still finding nectar. Lots of ivy grows around my neighborhood, and some weed flowers still persist. November 28, 2013…Well, my (inaccurate) thermometer reads 61 damp degrees and my foragers are out in moderate numbers, moving verrrry slowwwly. The bees appear healthy so I’m attributing their lethargy to the cool moist weather and perhaps advanced age. I can tell the bees I’m seeing are all experienced veterans because they approach the small entryway so accurately. The inexperienced foragers I observed in mid-summer came in crazy-fast and usually crash-landed on the runway, sometimes banging their heads against the hive walls or landing on other bees. Anyway, nothing worrisome to report regarding the colony. January 24, 2014…The Perone bees are busy foraging this morning, taking advantage of the unseasonable 64 degree F. (17.7 C) temperature. I’ve still never fed them. Hopefully they are finding nectar someplace (the myrtle trues seem to have buds). Solarbeez says…Hi Vernon, I’m so glad you decided not to feed. I’ve been reading Michael Bush’s book, “The Practical Beekeeper.” He talks about the pH of the hive. When you feed sugar, it raises the pH of the hive which makes it more susceptible to nosema. The only hive I’m feeding is the Warre, but I’m going to discontinue that. I never took any honey, but I CAVED IN to the temptation to feed them dry sugar. The other two hives are not getting fed and they seem to be fine. January 26, 2014…The Perone bees are collecting from a different pollen source today, a golden yellow variety. 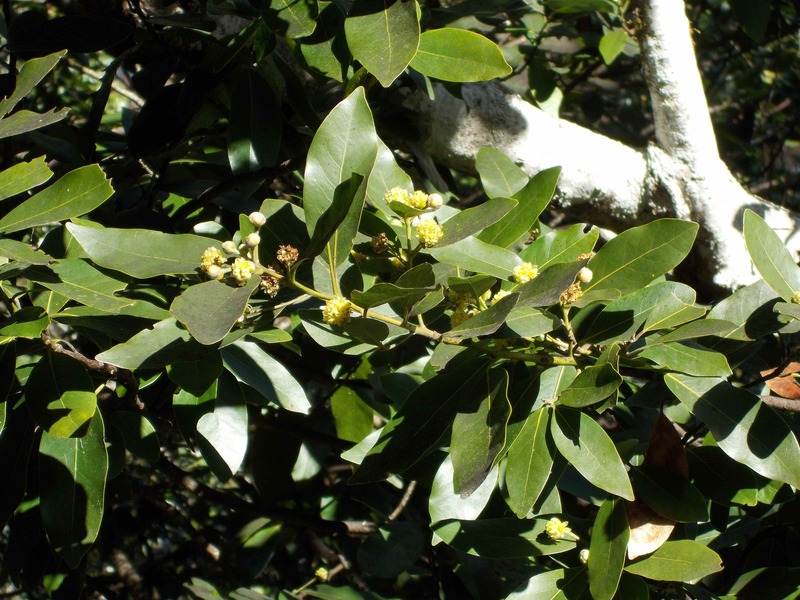 January 26, 2014…The only flowers I see in my yard are on these myrtle trees, which locals also call pepperwoods or bays. Of course, my bees never forage around my yard so I don’t know their actual pollen source. 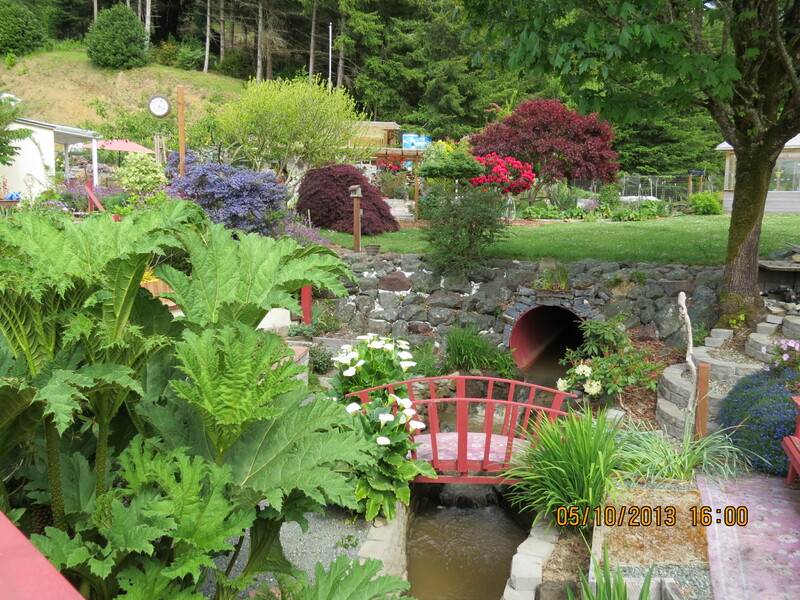 February 19, 2014…Drove to Crescent City this afternoon and Queen Anne’s Lace weeds were blooming all along the road. February 22, 2014…The foragers are out today in about the same numbers I saw during the summer. It’s likely the colony considers that Spring has arrived. A few dead or dying workers were on the ground below the entrance, probably over-winter bees that have been replaced by the next generation. I believe the queen started laying during the mid-January warm spell. About 20% of the foragers are bringing back golden-yellow pollen, which Carla believes comes from Myrtle trees. Odd that our west coast winter has been so mild while the east coast has been frigid and stormy. I’m hoping to finish my second Perone hive this weekend. Will send photos when I do. I also want to write a summary of my conclusions after taking a Perone hive through the winter without feeding or treating or helping them in any way. My friend Steve in Eureka lost 5 of his 6 Langs, including the one that housed the huge swarm I wrote you about (small, cold-adapted black bees from northern Europe). He’s looking into setting up a horizontal hive. Of course I’m in need of a swarm. Please let me know if you hear of one available. My congratulations on getting through the winter without feeding or treating. I welcome your conclusions on that. I understand your second hive will have an observation window. You’re going to love it. My log hive has bees that are fanning. I think they might be getting crowded. 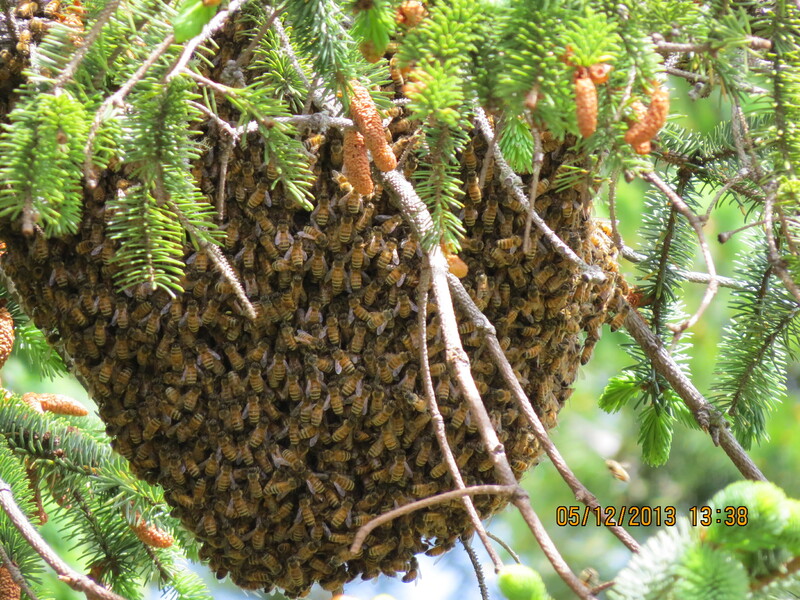 Last year the first swarm was on a hot 80˙F day on March 31. If the weather settles down, that could happen again this year. The first swarm has been promised away for a swarm swap. I’m debating whether to keep it (if that person’s hive isn’t ready) or give it away to try to get different genetics. I’m hoping my other log hive will attract a swarm without me interfering. If Vernon sends photos, I will post them here. 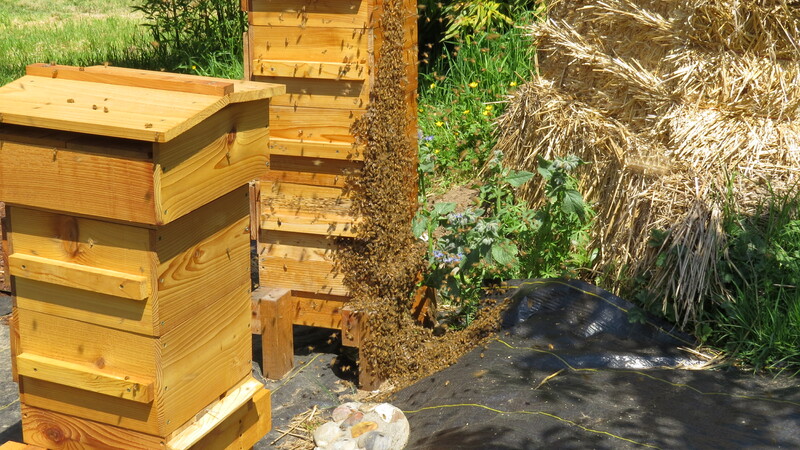 Last May I introduced a swarm of moderate size into a Perone mk2 hive. 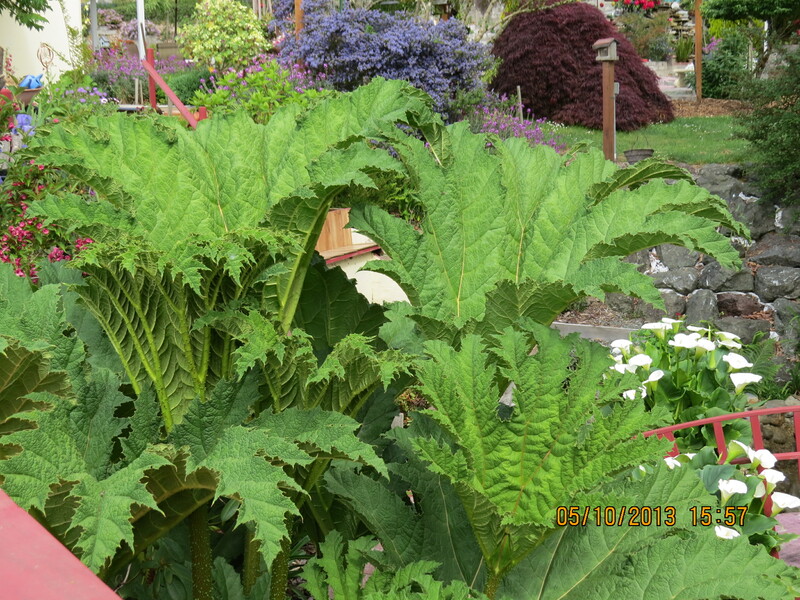 The colony survived the winter and appears to be thriving. Since the hive has no observation windows I infer colony condition by watching the numbers and behaviors of individuals who venture out. 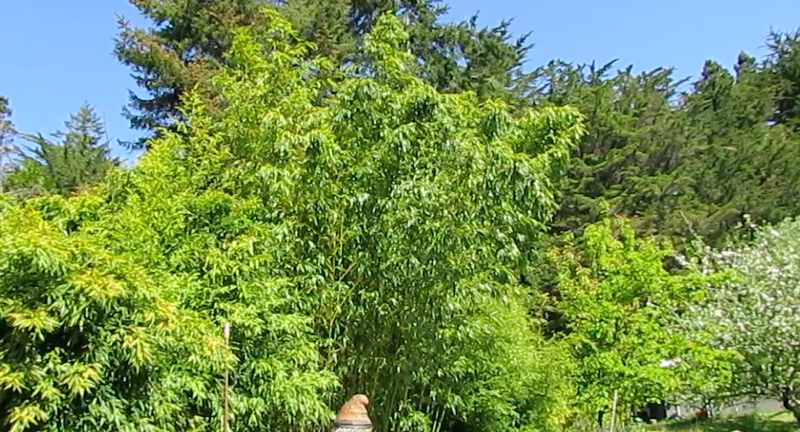 The hive is located in mixed woodlands on the northern California coast, USDA plant hardiness zone 9b. Winter was warmer than usual this year, with only one hard freeze. While it may be argued that survival through a mild winter isn’t an adequate test of the Perone design and philosophy, it remains that beekeepers in my area with carefully-tended Langstroth hives reported roughly the same high losses this year as previously. Hopefully the success of my hive will encourage others to try Perone hives. I strictly followed the Perone approach of benign neglect. I never fed my bees. They were industrious foragers and didn’t appear to need any sugar water. At times it was difficult to resist feeding, because experienced beekeepers I respect advised me in the strongest terms to either feed my bees or watch them die. They cited seasonal stoppages of nectar flows (while flowers were in bloom) and pollen production (when pollen.com warned allergy sufferers in my area of high pollen counts). 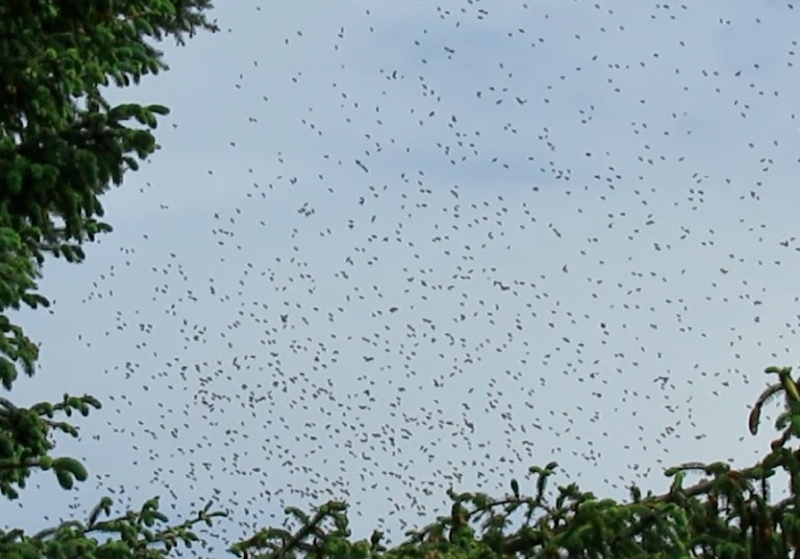 Swarms were represented as particularly vulnerable to starvation. My bees proved the experts wrong. Apparently feeding is so strongly entrenched in our beekeeping culture that it will persist superstitiosly no matter what. Hive inspections. I never opened my hive to check the condition of the comb. Typically beekeepers open their hives at least monthly to check for diseases, monitor comb development, and discourage swarming. 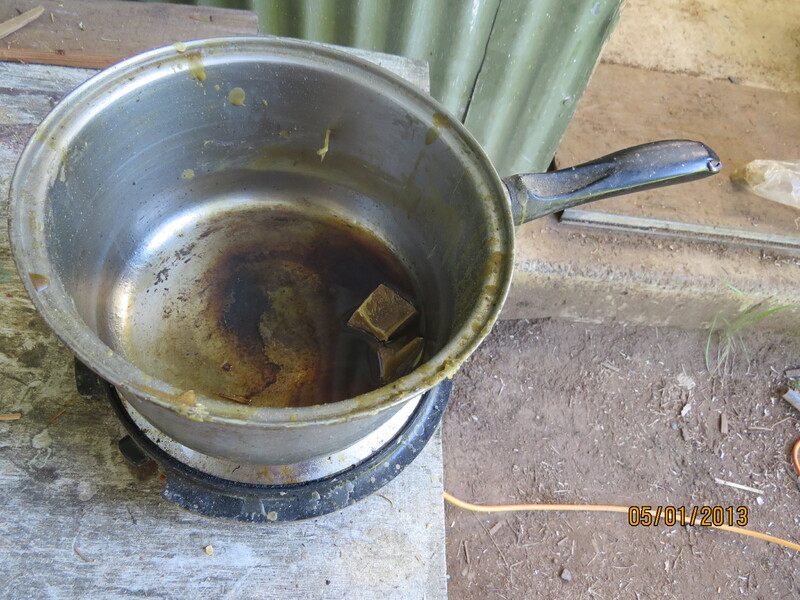 Disease treatment: I never observed disease syptoms in my Perone bees. 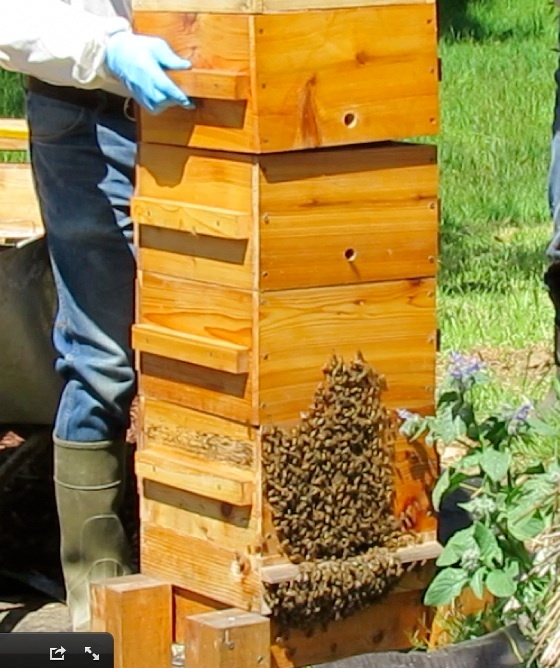 Of course they were given the “preventative medicine” of a Perone hive. The design of the Perone hive discourages disease through a more natural, healthful, undisturbed environment, and the relatively large populations of Perone colonies encourage thorough hygiene and robust reactions to parasite infestation. However, I do kill every yellowjacket I see. Monitoring comb development: The only apparent benefit of monitoring comb is that it’s fascinating for the beekeeper. The removeable frames or top bars of more traditional hives encourage maniputation of comb positions. For example, one of my colleagues found that some of his Langstroth hives were “honey bound.” These hives had a few brood frames located between frames of mostly honey, which he said inhibited the development of more brood. In response he moved the honey frames to outside positions to encourage more brood nearer the center. My colleagues often switch frames between hives. 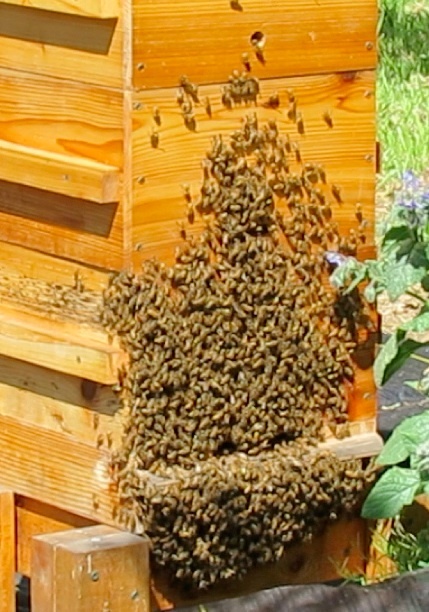 For example, if a hive is producing more brood and less honey than what is considered optimal a honey frame is brought in from another hive and exchanged for an “excess” brood frame. Drone cells and queen cells are often destroyed, as they consider worthless. Most destroy the “swarm cells” of developing queens to avoid population reduction in their hives due to swarming. Many “re-queen” (killed the queen and introduced a new one) when brood development doesn’t meet their expectations. These are the same beekeepers who report 30-40% losses or worse over the winter and attribute the survival of my colony to luck. 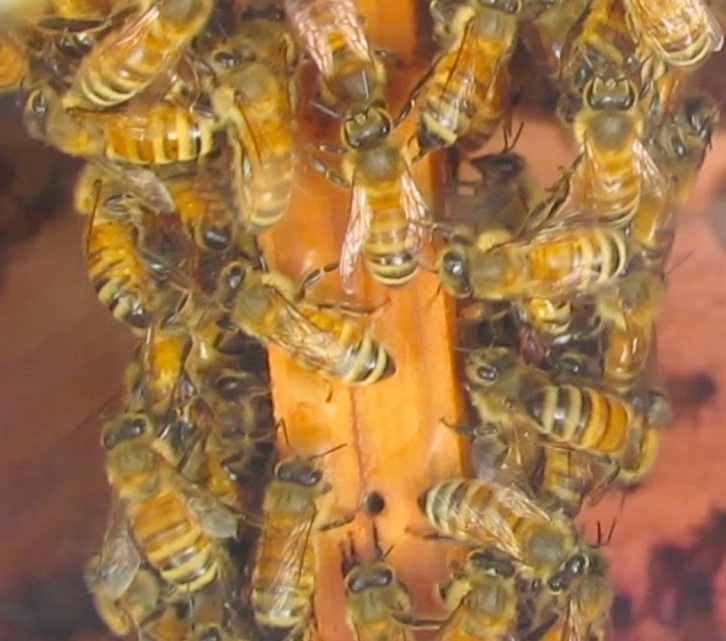 I never inspected the comb in my Perone hive—for all I know it may be “honey bound” and full of drone and swarm cells—but it seems to be working. The value of swarms: The swarm introduced into my Perone hive appeared very organized from the beginning. Foragers quickly set out in all directions, returned in an excited state, and congregated for waggle-dancing on the landing platform in front of the hive entry. After the first day the foragers I observed always left my yard and returned from the same direction. From this I infer that the foragers quickly found an optimal feeding area and returned to it regularly thereafter. 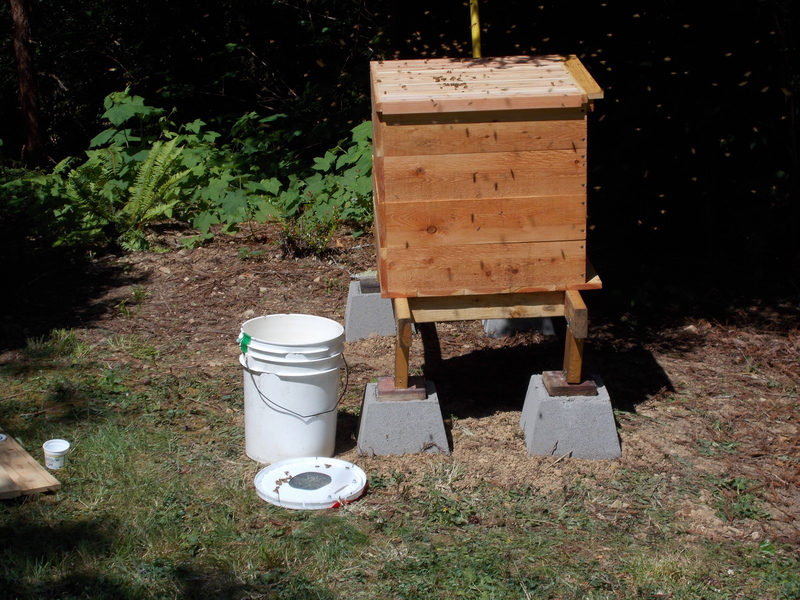 Last week I introduced a 3 pound package of purchased bees into a second Perone hive. So far these bees appear disorganized compared to the swarm. It took several hours for the package bees introduced inside the hive to discover and regularly use the single entryway, compared to about 20 minutes for the swarm. And I never saw the package bees waggle dance. Now, after a week, the foragers continue to meander around, each in her own direction, without urgency. 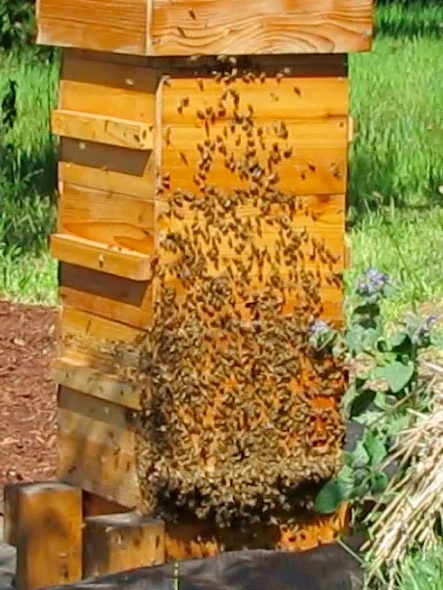 My theory is that a swarm is more specialized to establish a new colony than most beekeepers appreciate. The swarm population seems to be made up of an appropriate number of workers specialized to perform each of the needed functions. It’s known that individuals carry enough supplies in their bodies to begin the processes. 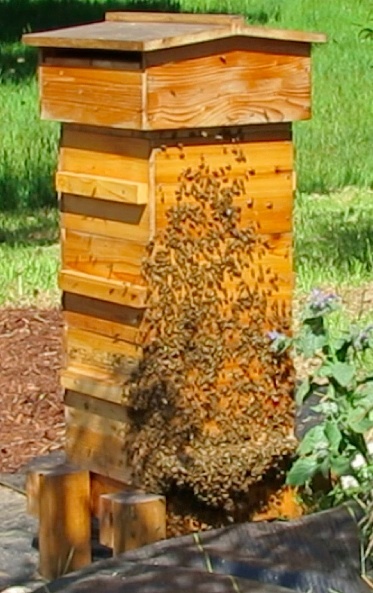 By contrast, package bees are shaken off frames pulled from established hives without regard for the functions the workers are currently performing. Then they are packaged with an unfamiliar queen and shipped off with some syrup to eat. What an awful start for a colony! In this first week I’ve observed a disturbing number of dead bees from the package bee colony. Other hive maintenance. 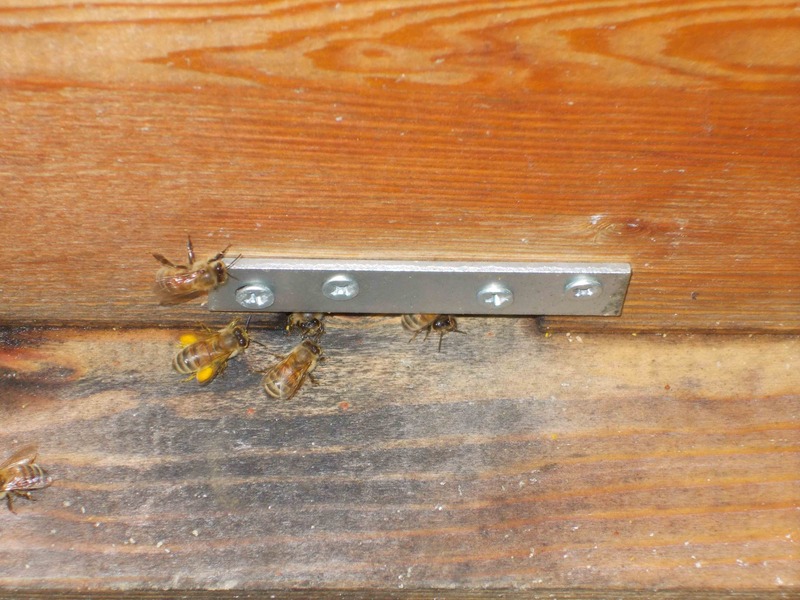 My hive is mounted on concrete foundation blocks that settled over the winter. The hive is no longer level. After some consideration I decided not to level the hive. 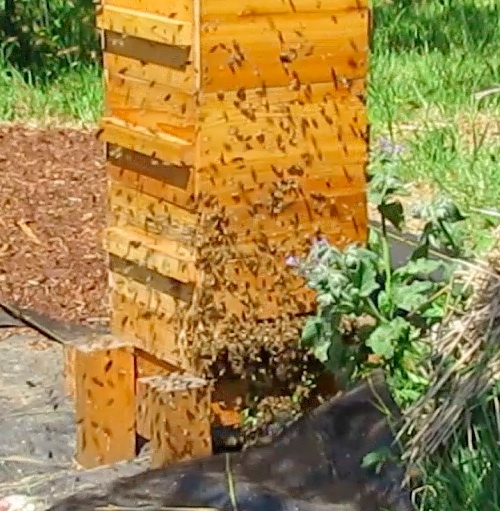 There are no rigid frames in a Perone hive, so the bees are free to angle their comb building to adjust for settling. Returning the hive back to level would require the bees to readjust. 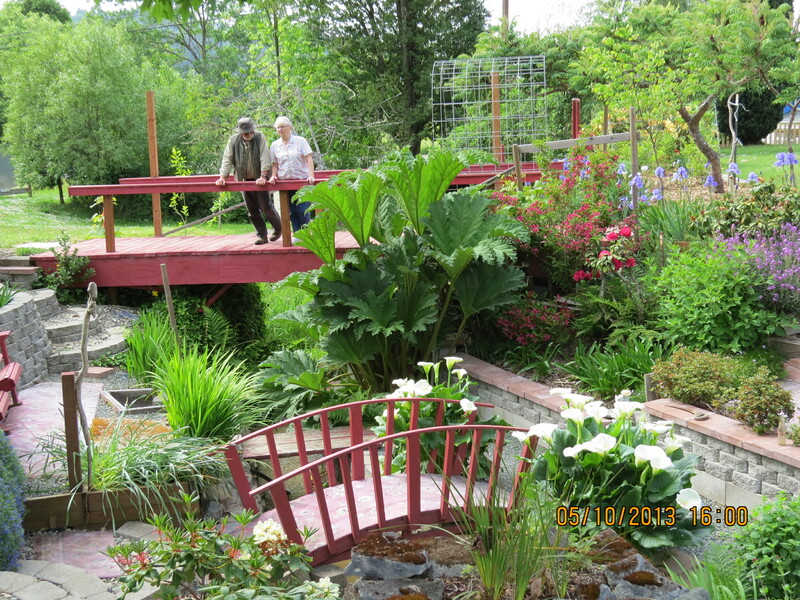 I just love standing on this bridge and seeing all the work Hal and Patti have done. It’s so beautiful. 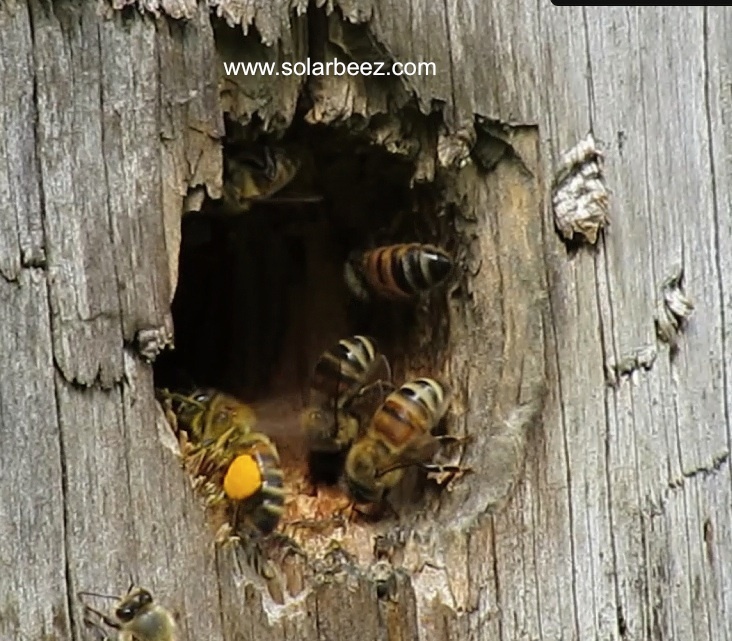 Hal called me up last week to say he took some video of a bee swarm flying INTO his unoccupied bee log. I’m thinking “Well, that’s a first. 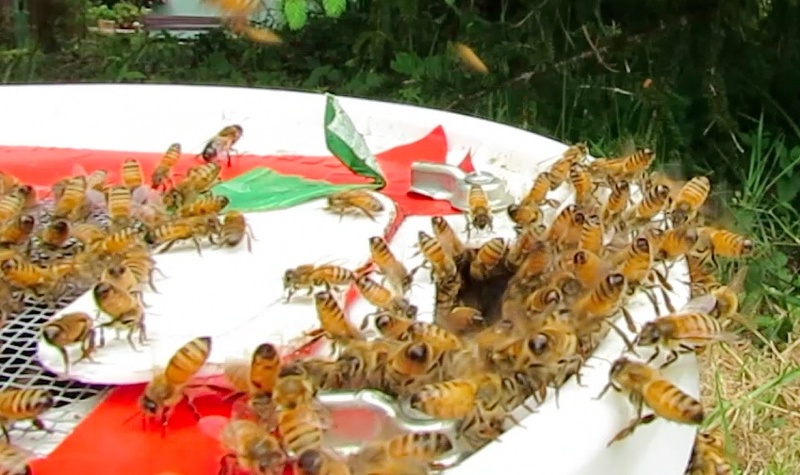 Whenever I see a swarm, they are flying OUT of something…like a hive.” I had to see this. While I was there I shot some photos of all the work they have done. I draw inspiration every time I visit. 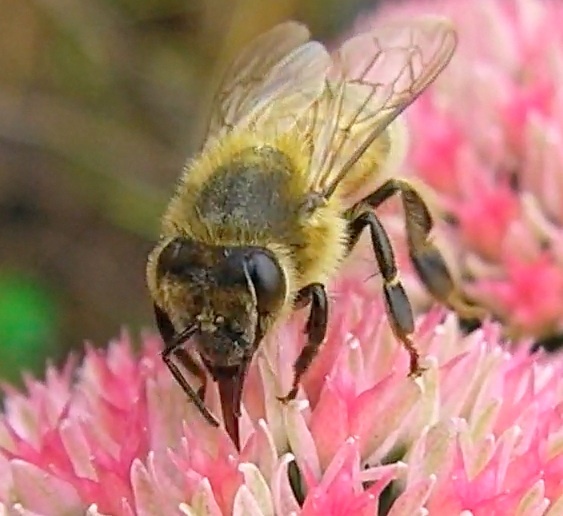 It was here that I learned about sedum and what a wonderful bee loving flower that is. There is so much color here, so many flowers. It surely takes hard work and dedication to keep everything looking so good. It didn’t take long for the bees to set up home. They swarmed INTO this log, April 18. 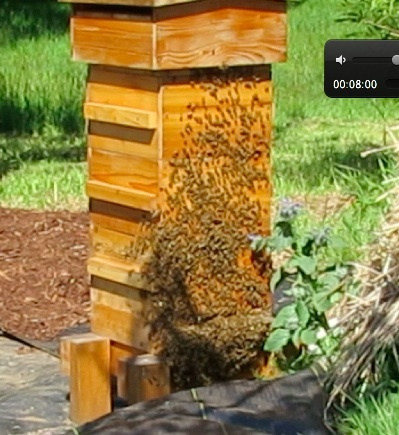 This video shows the swarm of bees moving INTO the vacated log hive. Hal explains what is going on as he shoots the video on his iPhone. All this is natural comb, built in less than two months from when the bees swarmed INTO the log hive. We let the bees coalesce on a branch. They settled down into a nicely shaped swarm about 12 feet (4 m) up. “The queen is over here…” Bee stick their abdomen up in the air to fan the pheromone letting stragglers know where the queen is. It was a win, win, win. My son-in-law, Jim Montgomery provided much needed assistance in corralling the swarm, my daughter was able to capture the whole event with the camera, and my wife was able to spend more time with our granddaughter. Where did the bucket of bees go? Well, I would have liked to put it into Bee-atrice log hive because it’s a ‘prime’ swarm, but Bee-atrice was already occupied. I found someone who didn’t want package bees. He has built a Perone style hive. It’s a BIG hive. 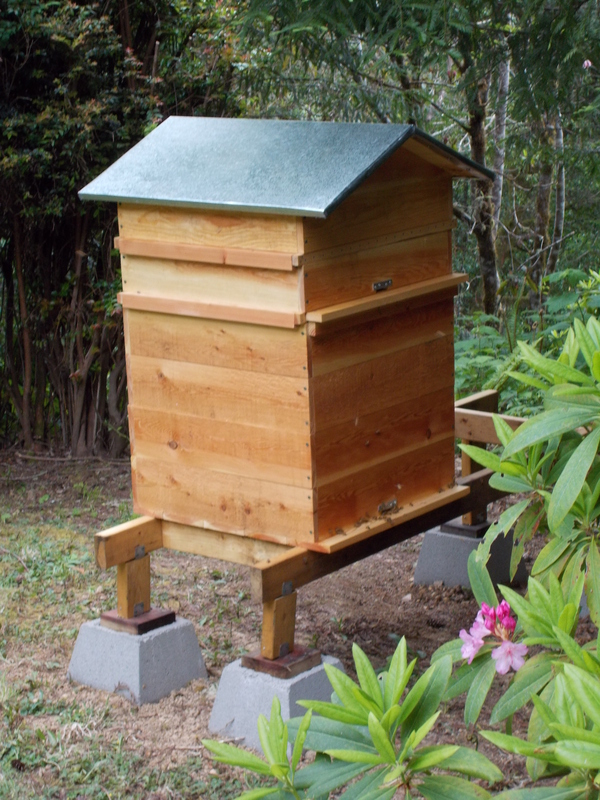 I like his attitude…”The Perone hive is built for the bees, not the bee keeper. It’ll hold about 150,000 bees. I’ll let them build their own comb.” We arrange for the ‘hand-over,’ and meet at a very scenic state park along the Oregon Coast. 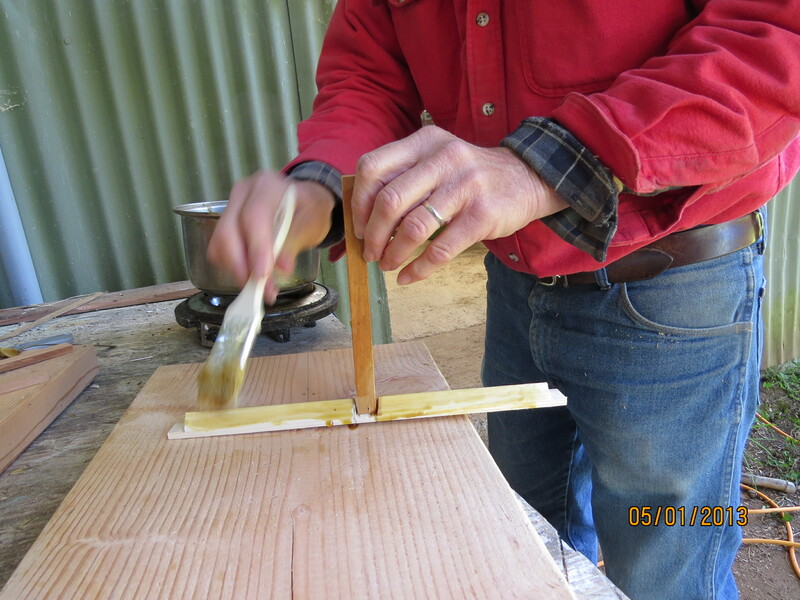 Vernon built his own Perone hive. He brought the framework holding 17 top bars where the bees will build their natural comb. He held it up so we could see how big the hive will be. In the background you can see why I wanted to live on The Oregon Coast. This is how the garden looked in August 1997. 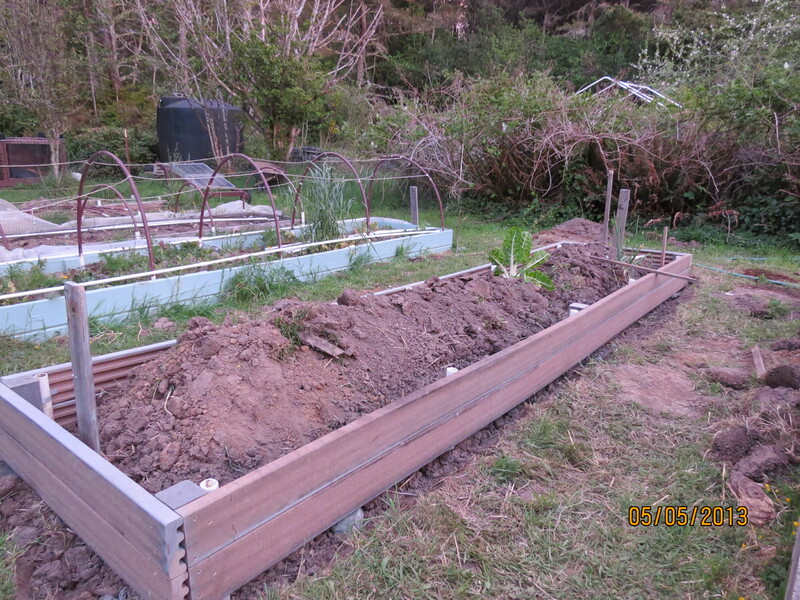 All those beautiful raised beds are now rotting into the ground after 16 years and need to be replaced. 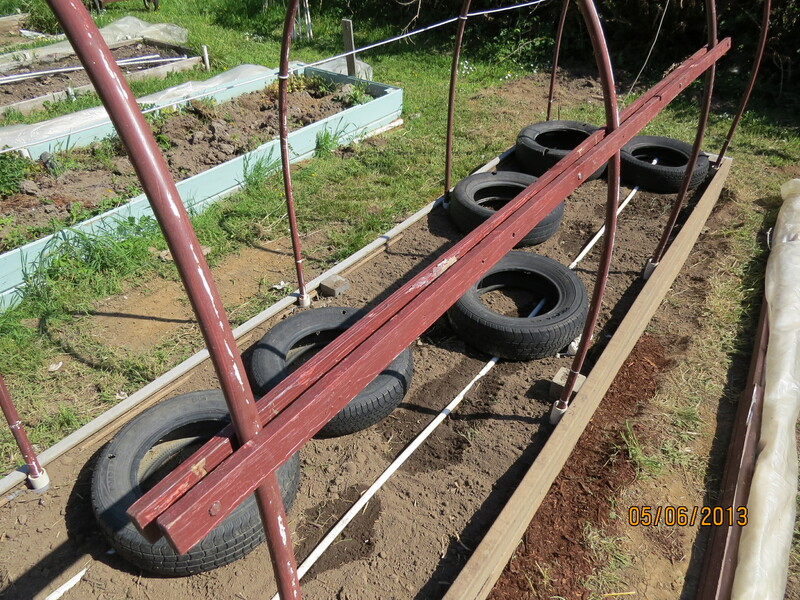 Trex-built raised bed 5-5-13 Don’t look at the background…it’s messy. I’m linear. I can only work on one bed at a time! 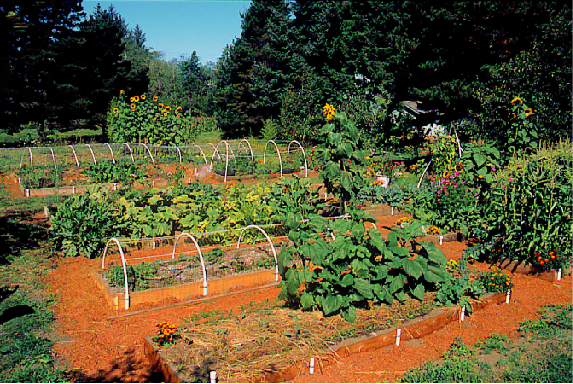 We built most of our raised beds in 1996 and ’97. The lumber came from a small sawmill using white cedar that had been passed over by the big timber companies. It was sawn to a full 2 x 10 x 16′ (5.08 cm x 25.4 cm x 4.87 m) It was beautiful wood. We had less personal time then but more energy…lots more. As good as that wood was, it still rots when in contact with the soil. So after 17 years all those 16 beds have got to be replaced. We found this decking material on close-out. It’s not cheap but is supposed to outlast wood. It’s a little wobbly so I had to set the corners in concrete, but if it outlasts wood, it’ll be worth it. We’re trying to replace ONE raised bed a year now. 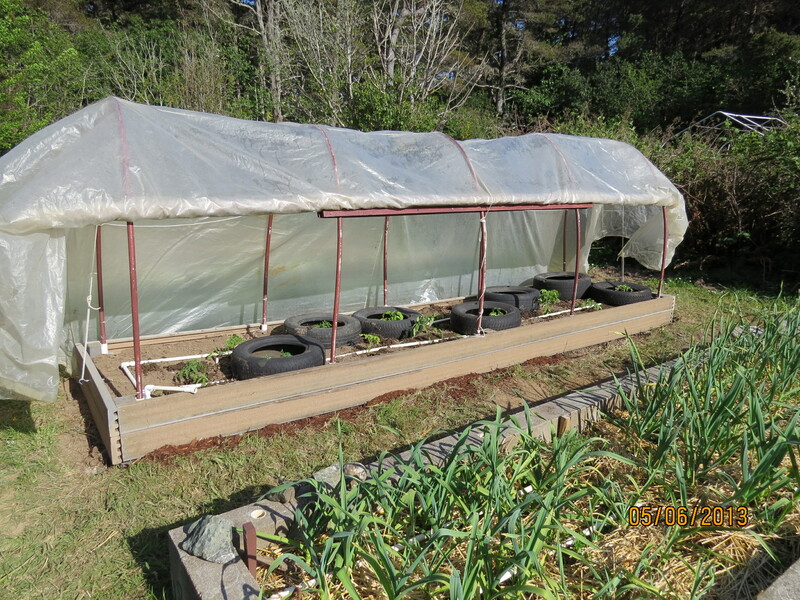 The green one was built last year out of old siding…much cheaper than this one, but won’t last as long. 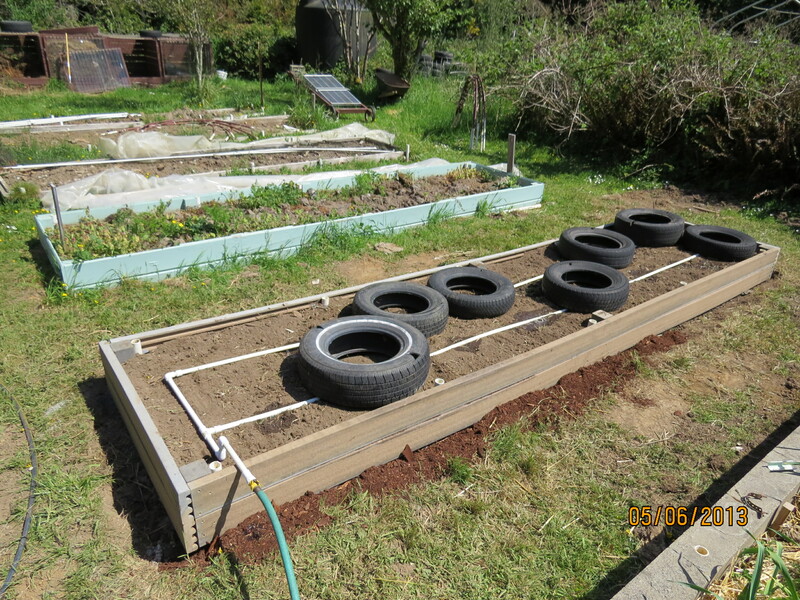 Soil leveled, drip water grid laid out, tires centered over drip holes. The tires extend the warm temps into the cool evening. Hoops added with 1 x2x 8 re-enforcement. I use this to hold the tent open too. Clear plastic over hoops, held up by rope and the re-enforcement wood. Why have ‘tents?’ Our night time temperatures will dip to 45 deg. F (7 deg. c) even in the middle of summer. Use 6 mil UV stable greenhouse film. It’ll last for years of opening and closing every day. We like our tomatoes to be warm and happy. 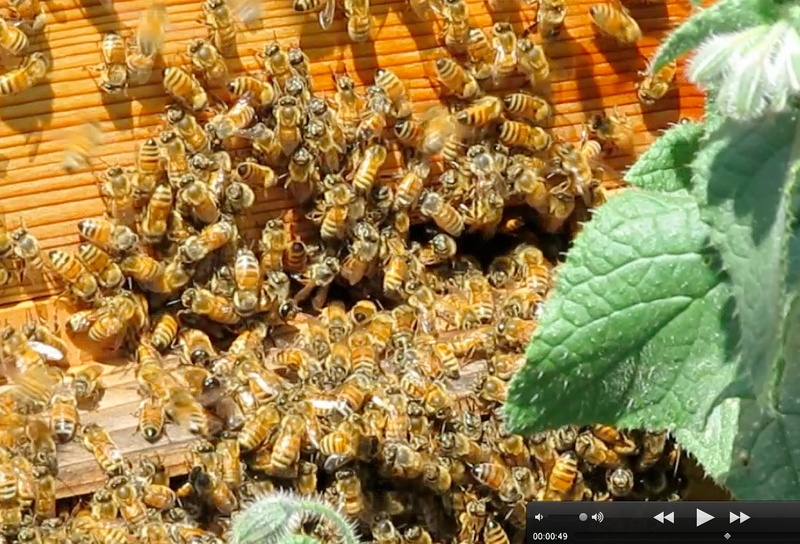 5-6-13…at 10:40 am there is an audible humming…the bees are revving up already. On Saturday, May 4, they started in again about 10 or 11 am. My wife was not happy that she was doing all the work in our veggie garden while I was happily shooting video on the bees, so the bees had to do their thing while I had to do my thing. After 15 minutes of frenzied flying, they settled down again with no tanging. So there goes my theory. On Sunday they were fine. On Monday they get all worked up again. Seems like there are lots more. I don’t have time to catch an impending swarm so I tang again to try to keep it close. 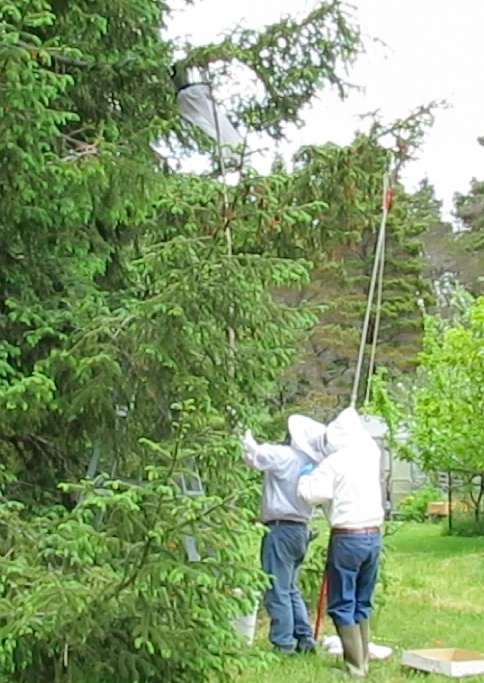 At 10-47, I start tanging to keep the swarm as close to home as possible. Temperature at 66 deg. F (less than 20 deg. C) They wouldn’t be bearding, would they? At 11:02 more bees are flying out. 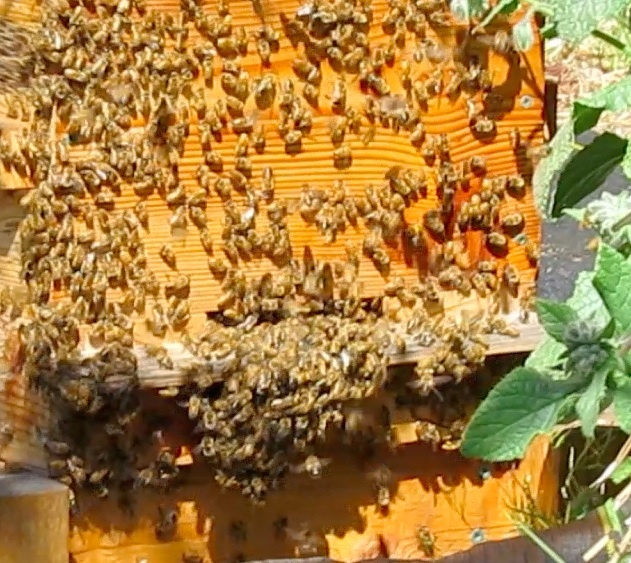 Some are flying excitedly above the hive as well as crawling onto the side. At 11:05 there are quite a few on the front, but fewer are flying around and they are flying lower. 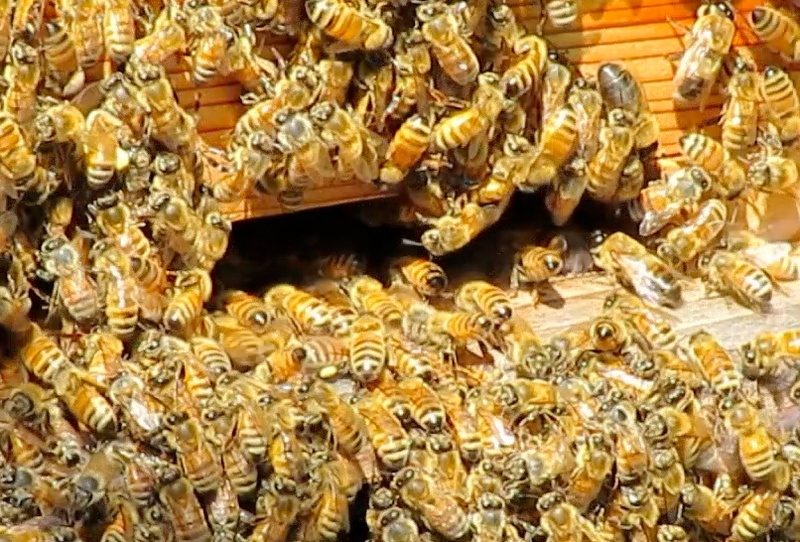 At 11:07 they are definitely calming now and actually filing back into the hive. At 4:38 pm, I checked on them again. Looks like they decided to stay on the outside. I shot this video and sped it up in parts to keep it relatively short. 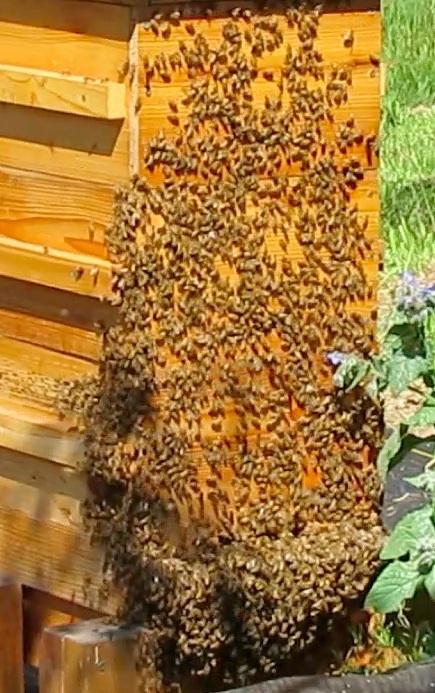 It was shot on May 3, so you can see the difference in the size of the ‘swarm,’ if it is a swarm…but if it isn’t, then what is it? What to do if you need to add ‘ladders’ to your Warre box, but you don’t have any comb. I don’t want to use any plastic foundation or anyone else’s comb. So I’m using melted organic wax and painting it on posts hung from the top bars. It worked last time so I feel confident it’ll work this time. It doesn’t take much wax, or much time to melt, so stick around when you do this. These are how the t-post ladders will hang down once they are in the hive…trouble is I couldn’t remember if the bees build comb with less than 3/8 inch or more than 3/8 inch. I started gathering the items together, went out to my bee hives and observed what looked like a swarm forming. I grabbed the melting pot and spoon and started tanging. Three days ago they headed back in when I tried tanging. Maybe this time too, then I’ll add the extra box and maybe they’ll be happy. At 10:44 am, they’ve calmed down for today…what about tomorrow? At 10:58 am I add the box with t-post ladders. I’ve got to get a hive jack so I can do this right next time. 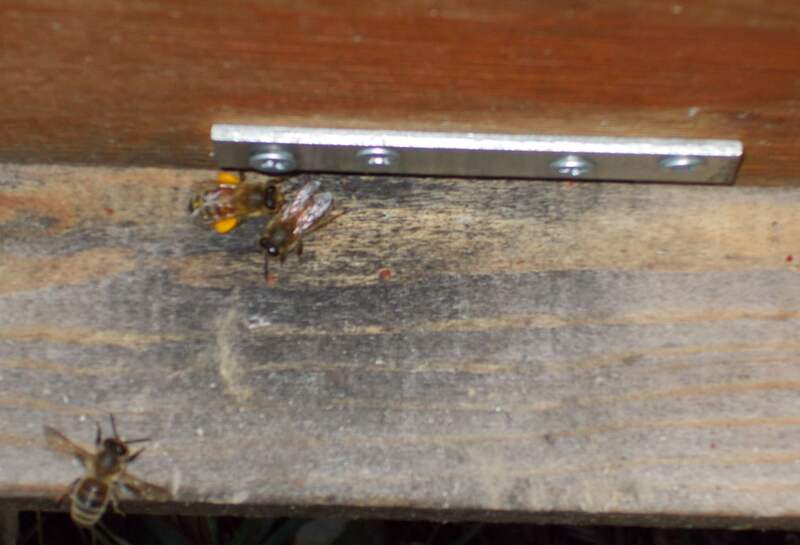 At 11:05 am, bees are crawling up t-post ladders already. Day 3, the bees are still climbing the posts and a daisy-chain is visible. More on tanging and video.